Synopsis: A remarkable true story set over one long Easter weekend; THE HATTON GARDEN JOB follows four ageing East End criminals – led by 76 year-old Brian Reader – and one mystery man who pull off the largest heist in English legal history. 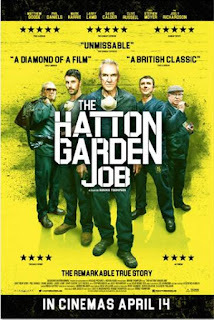 With everyone from the Hungarian mob to Scotland Yard on their tail, these old-school – and just plain old – villains set about achieving the seemingly impossible, drilling into a steel-and-concrete secured safety deposit vault in London’s well-to-do Hatton Garden jewellery quarter. But will they commit the crime of the century or pay with their lives?